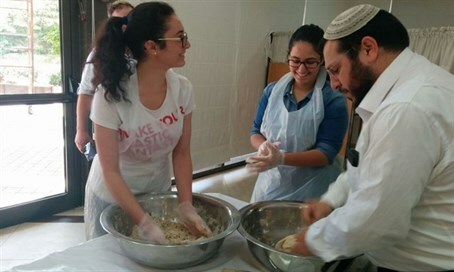 Around 200 girls participate in ‘spiritual and exciting experience’ of baking Passover matzot at Jerusalem’s Lindenbaum Seminary. Jerusalem’s Lindenbaum Seminary held on Thursday an all-female matzah (unleavened flatbread) baking event for the upcoming Passover holiday. Prior to baking, the group of approximately 200 girls participated in a special lesson regarding the general laws of Passover and laws of matzah baking in particular, in order to be completely prepared for the task ahead of them. "Anyone who has ever baked matzot knows it is a spiritual and exciting experience and women should also merit to be part of it… The experience was overwhelming and exciting, I'm happy to see women bake matzot," concluded Rabbi Teharlev.